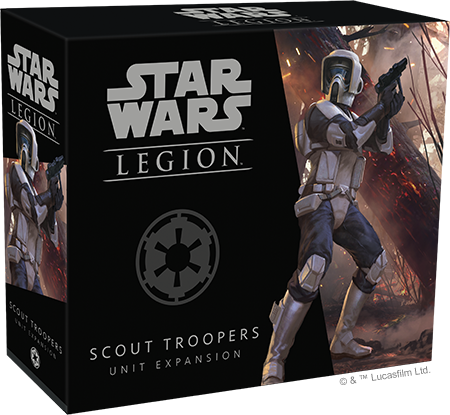 Fantasy Flight Games is happy to announce the Scout Troopers Unit Expansion for Star Wars™: Legion! While Stormtroopers form the bulk of the Galactic Empire’s infantry forces, elite troopers are sometimes needed. These soldiers are capable of both working in large groups and smaller teams, with their specialized training making them particularly dangerous. Soon, these special forces will roam the battlefields of your games of Star Wars: Legion. Within the Scout Troopers Unit Expansion, you’ll find a squad of seven unpainted, easily assembled Scout Trooper miniatures that can be used to field two different special forces units: a standard squad or a two-miniature strike team. Employing a variety of special-issue weapons, either of these units are ready to locate and secure key points on the battlefield, paving the way for more Imperial troops. 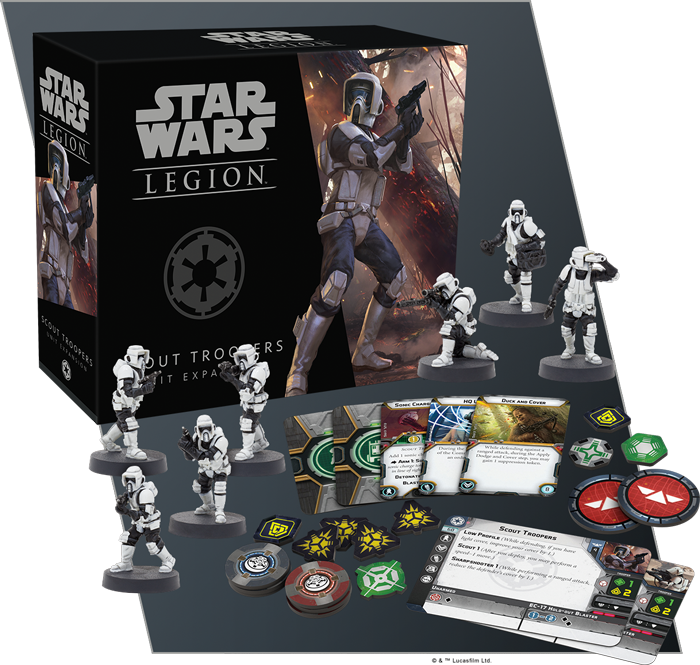 Additionally, the five upgrade cards included with this expansion can be added to the Scout Troopers or another unit, giving you more options for outfitting your Star Wars: Legion armies. The Scout Troopers Unit Expansion will be released alongside the Boba Fett Operative Expansion in the third quarter of 2018. For a closer look at that expansion, click here! 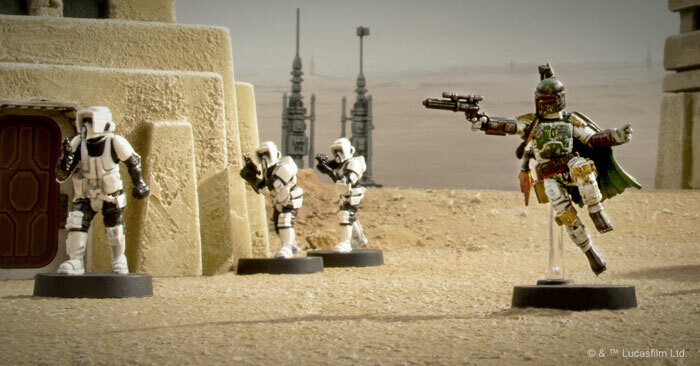 Scout Troopers bring a dose of much-needed versatility to Imperial forces. As a standard unit, Scout Troopers can easily be deployed ahead of other infantry, navigating dense terrain to eliminate opposing squads before enemy forces can react. When they operate as independent pairs, however, Scout Trooper strike teams can be deadly at either very close or very long range, depending on the needs of the battle and the conditions of the battlefield itself. This versatility should be expected from a special forces unit, and the Scout Troopers operate differently than other Imperial infantry units. Rather than the standard-issue E-11 Blaster Rifles carried by Stormtroopers and Snowtroopers, Scout Troopers are equipped with much more accurate EC-17 Hold-out Blaster. 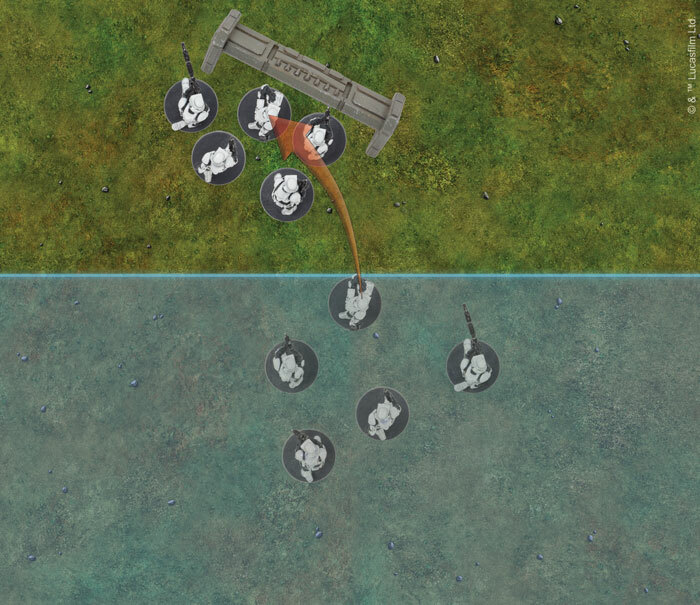 These weapons might not have the range of the E-11, but they make up for it in sheer firepower, with each miniature in the unit contributing two black dice to the attack pool. Where standard Scout Troopers operate best at medium range from enemy units, two heavy weapons miniatures can be added to your squads that greatly vary their operating effectiveness. You could add a Sonic Charge Saboteur who can disrupt enemy movement by seeding the battlefield with deadly charges. Alternatively, a DLT-19x Sniper can launch attacks against practically any enemy it can catch in its sights. With their Scout 1 ability, the Scout Troopers perform a speed-1 move into cover immediately after being deployed! On top of their weapons, Scout Troopers’ training in advanced reconnaissance has made them adept at using difficult terrain to their advantage. These troopers carry the Scout 1 ability, letting them perform a speed-1 move immediately after being deployed. This could give your Scout Troopers a head start toward any objectives that might be on the battlefield, or it could allow them to immediately enter cover and become a much harder target for enemy units. We’ll have more information about the Scout Troopers Unit Expansion and its upgrade cards in a future preview! Scout Troopers are the first Imperial troops on the ground, gaining a foothold on a planet’s surface long before other troops arrive. When combined with an elite warrior like Boba Fett, no Rebel force will be able to stand against you. Look for the Scout Troopers Unit Expansion (SWL19) to release alongside the Boba Fett Operative Expansion (SWL18) in the third quarter of 2018! You can pre-order your copy at your local retailer or online through our webstore today.